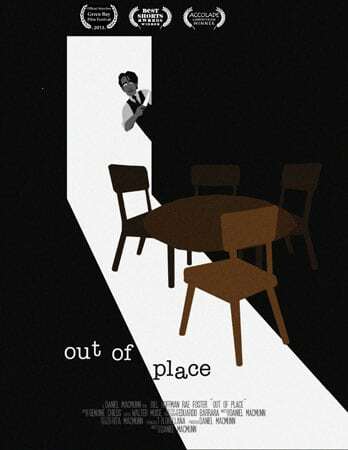 If you love “The Twilight Zone” then you will become an instant fan of “Out of Place!” The release will happen online, Halloween 2013, showing all day and night, on Face Book, Vimeo, You Tube and IMDB. Spencer is fixated on keeping everything in it’s exact, specific place. His obsession is so extreme it has cut him off from the outside world and is now threatening his five year relationship with his girlfriend, Samantha. After Samantha walks out on a romantic dinner he has prepared, he soon becomes a victim of his own obsessive behavior when random objects around his condo mysteriously shift out of place when he’s not looking. A single seat on an old train has a very peculiar talent. For when a passenger sits, he is warped into another reality where he is confronted with his major flaws, concluding with a twisted lesson at the end. Out of Place was an official selection of The Green Bay Film Festival. The film is also scheduled to show in October at The Hot Springs Horror Film Festival. It won best short at The Best Shorts Competition and “An Award of Excellence” at The Accolade Film Competition. The filmaker’s aim is to get as many people to view “Out of Place” on Halloween and after. The goal is 100k views to gain enough of an audience so the networks can see how popular the show is and hopefully get picked up in the near future. In the collaborative spirit of film making, Daniel MacMunn has launched a crowd funding campaign to help finance the next episode, “The Perfect Woman.” To obtain funding, they will be selling DVDs and posters offered after viewing on Halloween. hey will also be offering incentives to anyone who helps to get the word out, including a DVD package, exposure on their Facebook page, IMDB credit and advertising on all of their other sites. In the near future, Daniel hopes to collaborate with undiscovered, talented writers, actors and directors just like Serling did. He wants to honor Rod Serling by continuing his great vision, creepy themes and unique story telling. Most of all, Daniel wants to help launch careers of these artists while entertaining and creeping out a large fan base with original stories that pertain to our modern times.